A great invest for Charleroi. It has been confirmed to Eurobasket that Spirou Charleroi added Senegalese Center Mouhamed Saer Sene (213-C-86) to its roster for the next 2 seasons. Since playing for Verviers-Pepinster at the age of 19 during the 05-06 season, Sene has come along way. In 2006 he was drafted in the first round of the NBA draft by the Seattle Supersonics. Between 2006 and 2009 he played 47 games for Seattle, Oklamoma City and the Knicks, averaging 5.5 mpg, 2.2 ppg and 1.6 rpg. He also played 52 games in the D-League for the Idaho Stampede and the Albuquerque Thunderbirds. In those 52 games he had averages of 11.2 ppg and 8.8 rpg. After the 07-08 season he was voted D-League Defensive player of the Year. This past season he played in the French ProA league for Hyeres-Toulon . 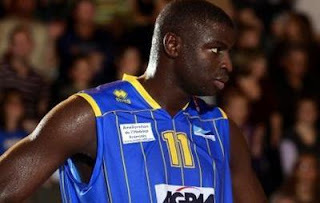 The 7 footer played 29 games for Toulon and averaged 12.4 and 11.4 rpg (nr 1 in league). While in France he was voted to several Eurobasket All ProA teams and was the co-defensive player of the year.